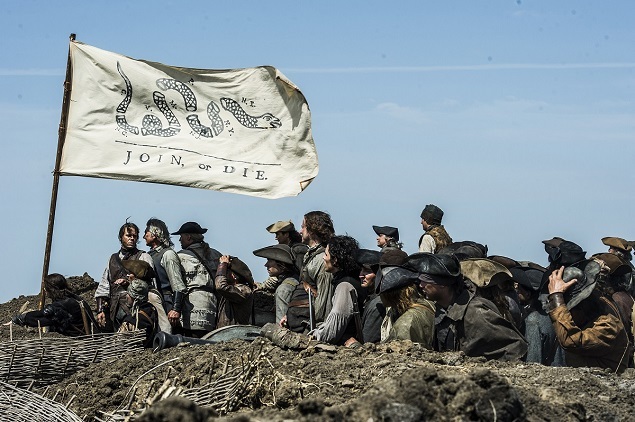 “Sons of Liberty”: Join, or Die. Photo by Ollie Upton/HISTORY. Copyright 2015. GALO: Do you watch a lot of Romanian cinema? GALO: I just learned something. DL: Yeah, the pen — the pen, which changed probably everything. After the wheel, the pen might be the greatest invention of all time. That was Romanian. GALO: You certainly seem taken by the country. You’ve worked on five projects. You’ve even written a screenplay that’s set there, right? DL: That’s right. We were days away from shooting, when a couple of things happened — as they do in our business. People had to leave and some money fell out. I’m still hoping to go back and shoot that one. Right now, I’m much more excited about a horror movie that I’m going to be doing here in Los Angeles called The Gathering, which is a collaboration between myself, Philip Morton, and Jonathan Heap. Philip has been a writer for years, working on projects like Fantastic Four. Jonathan Heap was nominated for an Oscar for a short film entitled 12:01 PM, which he directed. The three of us sort of put the story together, Philip wrote the screenplay, and we’re looking to shoot that probably by April to have it done by May. That one I’m really excited about because the character I’m playing, besides being the lead role, is a very complex character. He is agoraphobic, meaning he can’t leave the house. He’s [also] OCD, so a simple task like opening and closing a door requires him to open and close the lock three times. As actors, we love to find obstacles that make the pursuit of our objective more difficult. That’s a key thing that too many actors don’t do. Any time you can add obstacles that make it more difficult for you, you’re going to have a better performance because you have to work that much harder. These would be not only physical obstacles, but also mental and emotional obstacles. So it’s great to have both of those in a character. It really makes for a complex role. We’ve already started the pre-preproduction. I’m confident that the movie will be delivered by the summer. DL: Whether I get back to Romania to do the other film, I don’t know. This film certainly will take over my spring [going] into [the] summer. And then I’ve got all these other movies coming out that I shot there [in Romania]. Love by Design is coming out, which I did with Jane Seymour. Another film I did with the same director [Michael Damian] and Jane Seymour is called High Strung, which is kind of like Step Up meets Fame — and that will be out later in the year. One that I’m really excited about is Lost After Dark, which I actually shot in Canada before I got to Romania. This one stars myself and Robert Patrick as an homage to the ’80s slasher flicks. Any time you can poke fun at a genre and you can do it in the ’80s, that’s it. I’m sporting a big old Burt Reynolds mustache, and I’m playing a dad, which I haven’t gotten to do too often. They screened it here in Hollywood at Screamfest, which is the biggest horror [film] festival in the world. It got a huge reception from the audience. They were laughing from the opening to the end. It’s a very difficult thing to pull off. With a movie like this, you want to make sure the audience gets it and doesn’t take it too seriously. They still get scared, but they have a lot of fun on the way. That’s exactly what happened. It couldn’t have played [out any] better — and I got some very good write-ups. That’s written and directed by Ian Kessner by the way. GALO: You have so many projects going on at once. How do you stay so energized? Is it by challenging yourself like you said? Or do you just have a lot of coffee? DL: Yes, a lot of coffee. You know, the very act of working energizes me. Acting is not only what I love to do, it’s my passion. I’m compelled to do it. If I didn’t have one vacation day all year, I’d be fine. I’m happiest when I’m working. When I have too much time on my hands, I’m ill at ease. This was definitely a unique year. I don’t usually shoot five movies in a year. But the last few years have kind of been like this. In 2013, I did Non-Stop with Lacey Chabert, and we shot Lost After Dark. In 2014, I also did Dying of the Light with Nicolas Cage. That was written and directed by Paul Schrader who did Raging Bull and Taxi Driver. He is one of my heroes. There have been so many movies I almost forgot to mention that one. I’m extremely grateful that I’ve been around this long and I still have years like this, which tell me I’m still relevant and maybe more relevant than ever. There are different kinds of careers out there. There are some that are a straight line up and then come crashing down. There are guys I worked with in the early ’90s who don’t work anymore, [they] either retired, or went to law school, or do real estate. There are guys I know who have taken off and gotten to a certain place where they don’t have to worry that much. And then there are guys like me who have just had this bumpy ride. There have been some really good years and some not as good years. I’m kind of grateful for it because it’s kept me balanced. It keeps me hungry and on my toes. And it keeps me grateful for every job I have. Now that the last few years have been this good, it certainly doesn’t go unappreciated. It comes with a lot of gratitude. GALO: You seem to be in the middle of this bumpy road. You’ve got a good number of years and experience under your belt, but there’s obviously a lot ahead of you as well. How do you see your career moving forward? What would you like to achieve in the long-term? DL: It’s a good question. In the early ’90s I would have told you I’m a sitcom guy. Full House was probably my first really big show. I had a bunch of very strong pilots that looked like they were going to become big deals and didn’t materialize. If you can imagine, Bright, Kauffman and Crane, who created Friends, at the same time in ’93, they gave me my own show. That was their other pilot [along with Friends]. The co-stars were Tiffani Thiessen, Susan Ruttan, Kaley Cuoco, Giovanni Ribisi and Hilary Swank. We were all a bunch of high school kids in this FOX show. We tested through the roof. Everything said we should have been on TV. We had the best writers, the best cast, and an Oscar winner for God’s sake. But they got the rights to football that year, and some executive said, “This is a high school show. Now that we have football, we’re a real network. Let’s get out of these high school shows and let’s put on a family show to keep the football audience.” That was it, and they pulled us off the schedule at the last second. That’s the business. That’s something you have to accept. There are things in your control and there are things out of your control. GALO: That’s a shame. It sounds like a fantastic show. I certainly would have tuned in. DL: Yeah. Like I said, in the ’90s, it looked like I was a comedy guy and sitcoms were the way. In the late ’90s and early 2000s, I started playing a lot of bad guys in Lifetime movies. I started playing “the racist” and “the killer.” I did things like The Texas Cadet Murder with Holly Marie Combs, which is a true story where I cheat on my girlfriend and she makes me kill the girl I cheated with. I played the title role in the Black Widower, where I killed three of my wives. All of a sudden, I went from the comedy guy to the villain in all these network movies. And then, somehow, I started getting back into romantic comedies, like See Jane Date with Charisma Carpenter and I Do (But I Don’t) with Denise Richards. Ultimately, last year, I did this romantic comedy Love by Design with Jane Seymour. I’ve kind of been all over the map. What’s happening next? Well, I seem to have a bunch of horror movies [on the way]. Lost After Dark is coming out as I’ve mentioned. My next movie The Gathering is a big horror movie. I don’t know that you can pigeonhole me into any one category, which is great for me as an actor. I think that’s part of the good fortune of this rocky chart I was illustrating. No one format took enough time to typecast me for the rest of my life, because I had the good fortune to play all these different characters. If I showed you pictures from my last five movies, you would see five completely different looking guys. In Sons of Liberty, I’ve got the big wig on. Love by Design is a more modern piece, so I look as I do now. In the Nicolas Cage movie, I play a NSA analyst and I’m a soldier. In the horror movie, Lost After Dark, I’m in the ’80s with a big old mustache. Each one of these characters is physically completely different. For me, I think I have a lot of good fortune in these opportunities. I’d like to take the credit and tell you I chose my parts well, but that’s just not true. I just got lucky. Well, maybe I was responsible for that luck in being able to play different characters, but certainly lucky for the opportunities. GALO: The possibilities abound, it seems, moving forward. GALO: I just want to throw out one more option for you to consider. I’m a big Full House fan and I know John Stamos briefly reunited Jesse and the Rippers on the Tonight Show back in 2013. What do you think about reuniting your own band and going on tour? DL: I would like nothing more than to reunite The Monkey Puppets, which is the band I was on — and unfortunately, if he did the Rippers, that was the band before us. GALO: That’s right, Hot Daddy and The Monkey Puppets. DL: Right. We were the band on season eight, when I became D.J.’s boyfriend. I would love to have a shot at doing some shows with John. When we were doing the show, I brought up to him, “Hey why don’t we put out an album?” He was great. He actually let me write a couple of the songs, which he didn’t have to do. Funny enough, we get more money from the music royalties than from the acting royalties. GALO: So it sounds like a tour is in order. DL: Yeah, I would love nothing more than to do some gigs with John and be reunited. Last I saw him, he came to my production of Glengarry Glen Ross in Los Angeles, which was amazing. I was so happy that he came. So, I would certainly be open to that. 100 percent if anyone is asking. I’m in. GALO: I hope to see you on stage then. DL: I’m sure guys like Jimmy Fallon would love to put us on. He’s been great about putting on old shows. I think he had the cast of California Dreams [on his show]. It would be a lot of fun. I’d love to be a part of that. What do you guys think? Should The Monkey Puppets reunite and go on tour? Sound off in the comments area below! To keep up with David Lipper’s current and upcoming projects, you can follow him on Twitter @Lipdude as well as on his Facebook Page. And if you’re still left unsatisfied, you can visit his official Web site by clicking here.